A Southern Grace: [record scratch] crea-mix. Last Mother's Day, I unveiled my mamster's pie of choice--chocolate cream. Because she hasn't told me otherwise, I assume it still reigns supreme, much like she does in the Battle of Women Who Gave Birth to Me. I've tried a few more recipes over the past year, and I think I've found an even more decadent, fool-proof, and delicious version. The differences are minor--this one has cornstarch and uses less sugar and liquids with a lower fat content--but for some reason, it's just more decadent. One drawback--you have to strain the gelatinous goo before filling your pie shell. Meh, it's a small price to pay when you think about the 29 years and counting? 9 months or so of havoc you wreaked on your dear mum's body. Happy (Day After) Mother's Day! To make the crust, stir together crumbs, butter, and sugar and press on bottom and up side of a 9-inch pie plate. Bake until crisp, about 15 minutes, and cool on a rack. To make the filling, heat the milk, cream, and 1/3 cup of sugar until a thin skin forms on top. Meanwhile, viciously whisk together the remaining 1/3 cup sugar and egg yolks. Add in the flour, cornstarch, and salt. Temper in the very hot milk mixture, whisking well. Bring to a boil over moderate heat, whisking, then reduce heat and simmer, stirring constantly with a spatula for 1 minute (filling will be thick). Add the chocolates and let them melt into the mixture for a moment before blending it all together. Force the filling through a strainer into a bowl, then whisk in the butter and vanilla. Pour the filling into crust, cover the surface of the filling with wax paper and cool completely, about 4 hours. To make the topping, beat cream with sugar in a bowl using an electric mixer until it just holds stiff peaks, then spoon on top of pie. It looks ever so luscious! A fabulous creation. I wish my daughters would bake me a decadent pie!!! This looks Amazing! I like your ratios of cream to chocolate to crust...just looks perfect! That's some serious chocolate pie, Grace. Starting with the crust (I do love those wafers) and then the bittersweet in the filling. I'm not a chocolate fan, but bittersweet is a different ball game. cream pie with cream sounds perfect, I am especially fond of chocolate cream anything. That's a lot of creamy creaminess. Sign me up! I'll have to convince my kids (read: husband) to make this for me next year for Mother's Day. OMG Grace, this chocolate cream pie sure looks creamy, love all the layers and so wish to have a forkful of it. This looks lethal. Happy belated mother's day to your momma! I can't wait until my kids are old enough to bake me something like this. It looks scrumptious! My goodness, look at all the chocolate in one pie-how perfect! Love this Grace, the chocolate, and the generous amount of whipped cream. A chocolate loveers dream! It looks heavenly! A perfect treat for your mom. 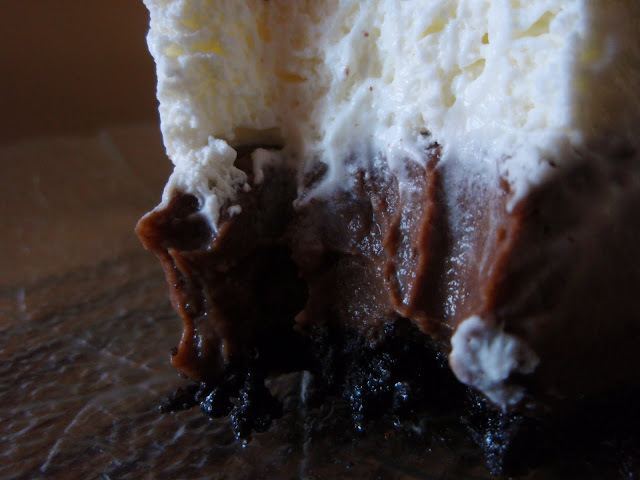 Love chocolate cream pie. Ma made these with regular pie crust for that salty sweet effect. Whatever way it's made it is yummers! Cream pie with extra cream? Now you're talking my language. :) That's one Mother's day treat I can definitely handle. I have 8 egg yolks in my fridge. I'm thinking TWO pies are in my future...one for me and one for anyone else who i allow eat it. Okay, really...two for me. Hola mi querida Grace...es una delicia suave y tentadora me encanta,abrazos y abrazos. And perfect belated mothers day! What a perfect -- and perfectly decadent -- way to celebrate Mother's Day. Yum! Less fat and more decadent? Life is good! That creamy chocolate filling looks fantastic. Your mom has excellent taste in pies! Yum! and I'm not waiting for someone to make this for me next mother's day. What a lovely treat for your mother on Mother's Day. She raised a fine daughter. God, that looks amazing. My family will go nuts for this pie thanks for sharing. The crust sounds amazing! I can have a large bowl with just crust :) It is 8:00 in the morning and I am drooling here! 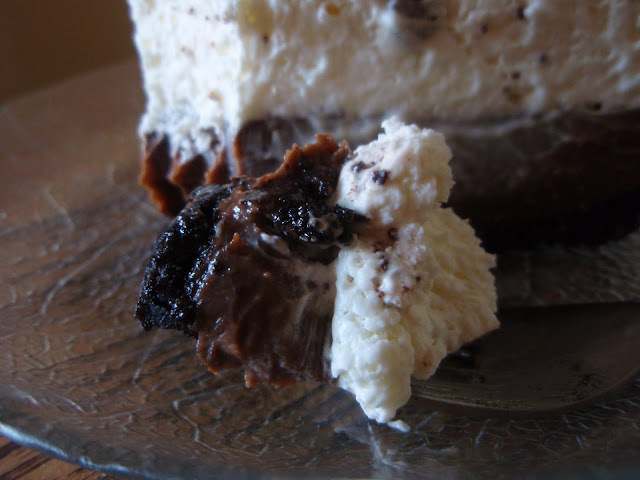 Chocolate cream pie - or any kind of cream pie - isn't a 'thing' here. I might be about to make it one though!